In what may be likened to a slap in the face with a velvet glove, Pope Francis launched a jeremiad against his closest advisors in speech that outlined a “catalog of illnesses” that allegedly plague the Catholic Church’s central administration. In his December 22 speech, the illnesses diagnosed by the Argentine pontiff included “spiritual Alzheimer’s” and gossipy cliques. He loaded up the assembled cardinals of the Curia with his remarks during his annual Christmas message. Some media described the cardinals as looking visibly uncomfortable. Pope Francis has been unstinting in meting out punishment to high level churchmen. For example, he removed a bishop in Germany who had spent $43 million on a grand new residence. He also effectively demoted Cardinal Raymond Burke, an American, from the Curia. Cardinal Burke now holds a largely ceremonial role as chaplain to the Military Order of Malta. Burke had become known as an opponent, despite his denials, of some aspects of the reform led by Pope Francis. “The Curia is always required to better itself and to grow in communion, sanctity and wisdom to fully accomplish its mission. However, like anybody, it is exposed to sickness, malfunction and infirmity. … I would like to mention some of these illnesses that we encounter most frequently in our life in the Curia. 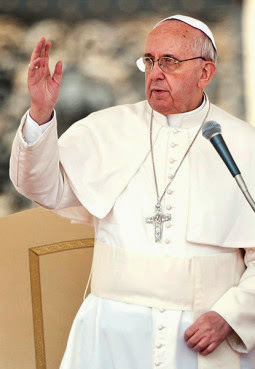 They are illnesses and temptations that weaken our service to the Lord”, continued the Pontiff. He invited everyone listening to the Christmas message to submit their consciences to examination as a means of preparing for Christmas. 2) …. “'Martha-ism', or excessive industriousness; the sickness of those who immerse themselves in work, inevitably neglecting 'the better part' of sitting at Jesus' feet. Therefore, Jesus required his disciples to rest a little, as neglecting the necessary rest leads to stress and agitation. Rest, once one who has brought his or her mission to a close, is a necessary duty and must be taken seriously: in spending a little time with relatives and respecting the holidays as a time for spiritual and physical replenishment, it is necessary to learn the teaching of Ecclesiastes, that 'there is a time for everything'. 4) “The ailment of excessive planning and functionalism: this is when the apostle plans everything in detail and believes that, by perfect planning things effectively progress, thus becoming a sort of accountant. … One falls prey to this sickness because it is easier and more convenient to settle into static and unchanging positions. Indeed, the Church shows herself to be faithful to the Holy Spirit to the extent that she does not seek to regulate or domesticate it. The Spirit is freshness, imagination and innovation”. 6) “Spiritual Alzheimer's disease, or rather forgetfulness of the history of Salvation, of the personal history with the Lord, of the 'first love': this is a progressive decline of spiritual faculties, that over a period of time causes serious handicaps, making one incapable of carrying out certain activities autonomously, living in a state of absolute dependence on one's own often imaginary views. We see this is those who have lost their recollection of their encounter with the Lord … in those who build walls around themselves and who increasingly transform into slaves to the idols they have sculpted with their own hands”. 8) …“existential schizophrenia: the sickness of those who live a double life, fruit of the hypocrisy typical of the mediocre and the progressive spiritual emptiness that cannot be filled by degrees or academic honours. This ailment particularly afflicts those who, abandoning pastoral service, limit themselves to bureaucratic matters, thus losing contact with reality and with real people. They create a parallel world of their own, where they set aside everything they teach with severity to others and live a hidden, often dissolute life”. 9)The sickness of “chatter, grumbling and gossip: this is a serious illness that begins simply, often just in the form of having a chat, and takes people over, turning them into sowers of discord, like Satan, and in many cases cold-blooded murderers of the reputations of their colleagues and brethren. It is the sickness of the cowardly who, not having the courage to speak directly to the people involved, instead speak behind their backs”. 10)“The sickness of deifying leaders is typical of those who court their superiors, with the hope of receiving their benevolence. They are victims of careerism and opportunism, honouring people rather than God. They are people who experience service thinking only of what they might obtain and not of what they should give. They are mean, unhappy and inspired only by their fatal selfishness”. 11)“The disease of indifference towards others arises when each person thinks only of himself, and loses the sincerity and warmth of personal relationships. When the most expert does not put his knowledge to the service of less expert colleagues; when out of jealousy … one experiences joy in seeing another person instead of lifting him up or encouraging him”. 12)“The illness of the funereal face: or rather, that of the gruff and the grim, those who believe that in order to be serious it is necessary to paint their faces with melancholy and severity, and to treat others – especially those they consider inferior – with rigidity, hardness and arrogance. In reality, theatrical severity and sterile pessimism are often symptoms of fear and insecurity”. 13)“The disease of accumulation: when the apostle seeks to fill an existential emptiness of the heart by accumulating material goods, not out of necessity but simply to feel secure. … Accumulation only burdens and inexorably slows down our progress”. 14)“The ailment of closed circles: when belonging to a group becomes stronger than belonging to the Body and, in some situations, to Christ Himself. This sickness too may start from good intentions but, as time passes, enslaves members and becomes a 'cancer' that threatens the harmony of the Body and causes a great deal of harm – scandals – especially to our littlest brothers”. 15)Then, there is the “disease of worldly profit and exhibitionism: when the apostle transforms his service into power, and his power into goods to obtain worldly profits or more power. This is the disease of those who seek insatiably to multiply their power and are therefore capable of slandering, defaming and discrediting others, even in newspapers and magazines, naturally in order to brag and to show they are more capable than others”. Furthermore, said Pope Francis, “We are therefore required, at this Christmas time and in all the time of our service and our existence – to live 'speaking the truth in love, we are to grow up in every way into him who is the head, into Christ, from whom the whole body, joined and held together by every joint with which it is equipped, when each part is working properly, makes the body grow so that it builds itself up in love'”.